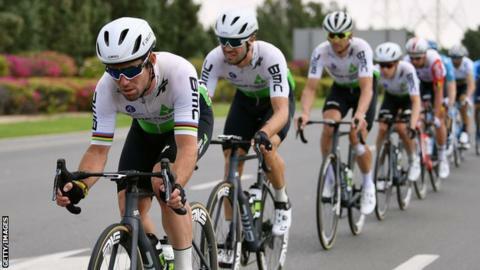 Britain's Mark Cavendish is the "best sprinter" of all-time and can "definitely" break the record for Tour de France stage wins, says his Dimension Data team-mate Bernie Eisel. Cavendish, 33, is four shy of Eddy Merckx's all-time record of 34 Tour de France stage wins. "The record is what drives him and why he is still in the sport," said Eisel. Speaking to the BBC's BeSpoke Podcast, Eisel said: "If we look back, he has won probably 150 races and 30 stages in the Tour, [he is] a world champion on the track, on the road, and pretty much won a stage on every tour out there and won one-day races. "He doesn't have to do it anymore, but he is chasing that record. Of course, that creates a lot of pressure but he is dealing with it." In August 2018, Cavendish announced he would take a period of total rest from cycling as he looked to overcome EBV - which causes glandular fever. On Wednesday, his team told Cyclingnews they "didn't know" when he would next race. "For me, if we talk about guys like [Cavendish], Chris Froome and the other guys who have won races and come back every year, repeat it every year, I have the biggest respect for them," said Austrian Eisel, who last April had surgery on a brain haemorrhage he sustained in an accident. "The guys who still keep winning, that is outstanding. There is only a handful every decade who can do that. "I think if we look back at Cav, he has been doing it for almost 15 years, in different teams, different line-ups. "I think together with [Dimension Data team-mate] Mark Renshaw, they are the best lead-out man and best sprinter together."